Solar eclipses are creation events. When the Moon's shadow is swiping past Earth it likewise inserts a surgical cut, allowing for a new graft to be planted. 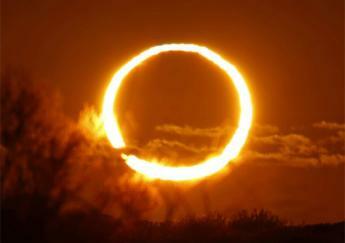 This Annular Solar eclipse occurred at the Moon's descending node in Taurus. 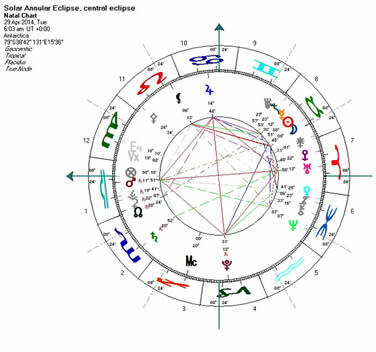 South node eclipses bring our focus to unresolved issues, asking us to tie up loose ends. We do best following through with what we started earlier, diligently striving towards the accomplishment of important projects. After 20 partial eclipses, the April 29 Solar eclipse is the first annular one of this Saros cycle (#148) which was initiated in 1653. There are quite a few unusual features to this eclipse: Its annular phase was very short, only lasting for six minutes, and only visible from a very remote location of Antarctica. No longer than six minutes the entire silhouette of the Moon was within the Solar disk, producing a ring of fire. Considering that most eclipses leave shadow corridors of thousands of miles behind, this one literally punctured Earth, making the eclipse's impact sharp and concise. Due to its remote location and short duration, this eclipse hasn't been photographed, something unheard of in our modern times. Thus we could say, the essence of this celestial spectacle hasn't really been revealed, rendering it deeply mysterious. Even just one conscious observer would have been enough for everyone to connect with the event, considering all humans being connected by quantum entanglement. These many unusual attributes indicate this eclipse might be a wild card and we may be in for a huge surprise. The ninth degree of Libra is rising, retrograde Mars is just a few degrees away. The Red planet is continuing to move backwards, closing in on the Ascendant. On May 20, Mars will turn direct, at 9° 01' Libra, hugging the Ascendant. Hexagram #18, Working on what has been Spoiled, Correcting the Corruption, is strongly emphasised. The Ascendant is in line 5, while Mars will be turning around in line 6. The guidance of Hexagram #18 says: "Work against corruption. This is a beneficial time to engage in an adventurous task. Prepare carefully in advance, and make a thorough inspection afterwards." Hua-Ching Ni's comment on the central fifth line: "Correction is possible because of cooperation from the people... Correcting what is spoiled is not a negative undertaking, it can further and refresh the positive aspects of the past and stop the confusion of the present." Indeed, great times are around the corner! In many places we see indications that change is on its way. One event which broke the ice was the legalization of cannabis in Colorado, on January 1, 2014. It might look small, however this was a symbolic move showing that we don't have to wait for central governments to change laws and regulations. Since then we've seen numerous examples of smaller entities - states, districts, cities, neighborhoods - taking a stand against central governments and corporations, refusing to obey stupid rules, putting an end to detrimental developments.